The biennial Brisbane Truck Show is estimated to generate more than $400 million in sales orders, $57 million of extra expenditure in the Queensland economy, in excess of 248 equivalent full-time jobs, and ranks as the biggest event in the Brisbane Convention & Exhibition Centre's 27-year history. This is based on an economic impact assessment by the AEC Group. The biggest names and brands in Australia are backing the event, led by Platinum Partner BP Australia, Media Partner Bauer Trader Media and a list of political, sporting and entertainment celebrities, including the Queensland Premier Campbell Newman, who will open the event, and rugby league legend Shane Webcke (pictured), who is back again as the Show's Official Ambassador. Newman says he's looking forward to opening the Show, which will occupy all three levels of the BCEC from May 16 to 19. "I look forward to opening the Brisbane Truck Show and show my support for an industry that plays such a vital role in keeping Queensland moving," he says. The Show promotes every aspect of the transport industry and that's why BP Australia has chosen to strongly support the event. "We are really pleased to be able to support the truck industry, by being part of events which bring people together to share knowledge and learning which make for a stronger and safer industry," BP's Head of Sales and Marketing Mike McGuinness says. The event has a long tradition of breaking the biggest stories in the transport industry and this year it will be no exception with the latest equipment on display, including hybrid technologies and even a fully electric distribution vehicle range. 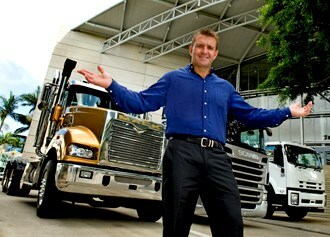 The Brisbane Truck Show is the premier showcase of trucks, trailers and equipment in Australia. Importantly, it has been 'run by industry, for industry' since 1968 by the Commercial Vehicle Industry Association of Queensland (CVIAQ). The event has grown in prominence and professionalism while also retaining the grass-roots feel, but in a world-class venue. With 287exhibitors and around 36,000 attendees over four days it truly offers something for everyone. Sure, the Brisbane Truck Show has lots of great new trucks and trailers that have the latest technology enhancing safety and reducing noxious emissions but the Brisbane Truck Show also has so much more. It is a place to celebrate careers in transport with a string of great initiatives focused on Transport Careers in a dedicated Careers Centre. "This year's Brisbane Truck Show will give exhibitors, visitors and people wanting to get into the transport industry a great snapshot on the wealth of opportunities available," CVIAQ CEO Brett Wright says. For more information on the event visit www.brisbanetruckshow.com.au or keep an eye on this website for breaking news as the show unfolds. Upcoming editions of ATN and Owner//Driver magazine will also feature comprehensive reviews of the Show, including the latest product releases.